The filtering functions for translation documents in memoQ are really cool. I'm not talking about the import filters for different types of documents, though most of these are rather good, and improvements are being made all the time. I mean the ways in which you can use filters to look at the content you are translating and sort and navigate it in different ways. 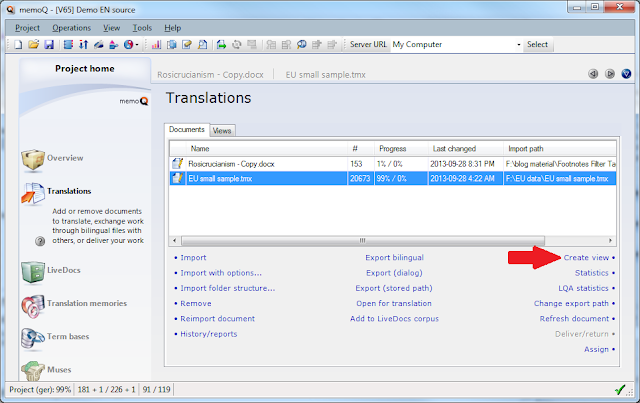 The filters can be used to create static views from one or more translation documents selected on the Documents tab of the Translations window of Project home using the Create view command. I use this function a lot to create comment and feedback lists for clients or select some particular part of my content that I want to save and work on or share separate from the rest. Exported as bilingual RTF tables, the content can be corrected or questions answered in the comments column, and all the changes and commentary can be re-imported to update your project. Source and target text filtering of the segments can be made case-sensitive by marking the icon (1). Any number of filtering operations can be applied cumulatively in sequence, and filters applied with the source and target text fields can be cleared with the red X icon (4). To clear a sorting filter, you must select "No sorting" from the dropdown menu. These view filters can be very helpful for translation and quality assurance. But what many do not realize is that memoQ also allows you to navigate through translation segments using filter criteria. This is done with Edit > Goto Next (Ctrl+G). The filter criteria to apply for navigation are chosen under Edit > Goto Next Settings (Ctrl+Shift+G). This often has the advantage over view filtering that all the segments remain visible and you can see the context better. Examples of this are shown for navigating to commented segments and navigating through the many footnotes in a document to check their formatting in the short (3.5 minute) video tutorial below. It was prepared with the most recent build of memoQ 2013 (6.5.15) and shows the new "golden" bubble icon for commented segments. The video demonstrates (with footnotes) how tag type can be used as a filtering or segment navigation criterion. This might come in handy for an academic thesis or a legal document with many footnotes to check. Use the icon at the bottom right of the video to toggle full screen mode for viewing; this makes it much easier to see the details of this somewhat fast-paced clip. 3:23 Oops! I join something I shouldn't and split the segment again, hoping nobody will notice. Subscribe to my free YouTube channel and I think you'll receive updates of new video tutorials I add (or at least it'll be easier to find them). I would also like to thank Ulrich Scheffler of LSP.net for providing me with a Camtasia license recently to support my teaching - it's much better than the free Open Source CamStudio I started working with months ago, though I can definitely recommend CamStudio as a good tool to get started with making demonstration or teaching videos.